This past week, one of my dear friends that I taught with several years ago emailed me about one of her students. The student’s father had passed away unexpectedly. She wanted to help her student at school and was looking for ideas. In my twenty years of teaching experience, I’ve only had one student go through this. I am thankful that I am not very experienced with this. The next day, my mom called and told me to turn on the news. This was the day of the tragedy in Connecticut. At this time, we as a country are grieving in our own way. I do think teachers feel the loss differently, though. It’s taken away our sense of safety in the work place. Maslow recognized the importance of personal safety. Maslow’s hierarchy of needs places safety on the second level. It is such a basic need that is taken for granted on a daily basis. Teachers enter the profession because our love of children and our passion for learning. It is unimaginable that something like this could happen at an elementary school. The worse thing we should have to worry about is being exposed to a cold or flu virus. We have no way to defend ourselves or the children in our care. I think it will be some time before we come to terms with what happened. In the meantime, you might have a student who is going through the stages of grief in your class and be able to use the tips below. Thankfully, I have only had one student who experienced the loss of a parent. My student’s mother died the summer before she entered my class. The father and the family had a good support system which helped. Initially, I didn’t see any behavior problems. But, then a few weeks into the school year, my student began to take my other students’ snacks. My students always brought her own snack from home so I wasn’t sure why she was taking my other students’ snack. Her father sent her two snacks thinking she was hungry, maybe going through a growth spurt. The problem continued. I finally noticed my students’ conversations at the beginning of snack time. When they were getting out their snack they asked each other “what did your mom send you for snack today?”. I think the conversation was reminding her what she was missing on a daily basis. It was putting salt into her open wound. I spoke to my counselor about the issue. We worked out a deal where I sent my student to the counselor every day a few minutes before snack time. The counselor kept a basket of snacks in her office that the father provided. My student chose a snack and the counselor chatted with her for a few minutes. It allowed the counselor time to check in with my student. My student knew that if she ever needed to talk to the counselor, she had this designated time. By the time my student came back to the classroom, I made sure all the “what did your mom pack today” conversations were over. The snack issue was solved. The student may behave differently . . . withdrawn, more friction with their friends, frequent visits to the nurse, staring off into space, aggressive, crying frequently, clingy with you, wanting your approval for school work, falling asleep at school because of sleep problems at home, coming in tardy at school because of problems going to sleep at home, and many others. When your student is having trouble – not able to concentrate on work or get along with classmates – let him/her write in a feelings journal. Ahead of time set up a special place (quiet place in classroom) that your student can go to work in their feelings journal. Ahead of time introduce the feelings journal to your student. A feelings journal can be a plain spiral notebook that you let your student decorate. In the work place, put special crayons, glitter pencils, and other special supplies. When your student needs to work in the journal, tell him/her that he/she can draw or write whatever he/she wants. If you have time, let him/her either read what he/she wrote or dictate sentences to you. This gives him/her a chance to talk about his/her feelings. The months after the death of a spouse is stressful on so many different levels. When you have a small child, the stress grows exponentially. As a teacher, don’t add to the parent’s stress level by sending home piles of homework. Reading homework is enough homework for this year. This is something that can be done at bedtime. If there is math worksheets or other projects that you feel your student needs to do so he/she doesn’t fall behind, find creative ways to get the work done at school. Can the child come to school early or stay after school and do it with you? Does your school have a homework club? Is there an older student who could be a mentor during lunch time? Where there’s a will there’s a way. Your counselor will know of extra resources that are available for your parent and family. 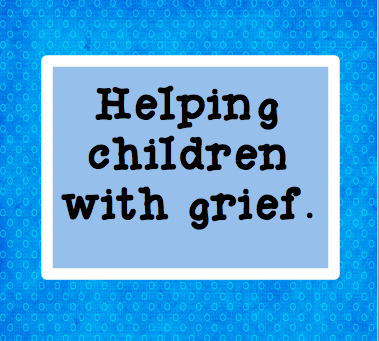 Grief counseling groups, financial assistance, and other organization are available to help families. This is one of those times when the village should help raise the child. Your role is to be the Mayor of the village and organize everything that needs to be done to properly support your student. I just wanted to let you know that I shared your post on my Thumbs up Thumbs down Thursday – as a thumbs up of course 🙂 – because I really thought it was a great post!